On the 21st we passed many gigantic trees. We measured several. The largest was thirty-three feet in circumference. In the evening we camped on the banks of the Mississippi; received a very large mail with abundance of news from Grant's campaign against Lee in Virginia. Our retreat was now ended, the enemy having abandoned the pursuit, in force, back at the Atchafalaya. Other reports say the regiment marched all day of the 21st and nearly all night and then camped. The point at which the 16th Ohio camped on the night of May 21, 1864, is highly estimated in the maps below. There is, however, some evidence on a military map showing this particular route used by Banks' forces during the Red River Campaign. 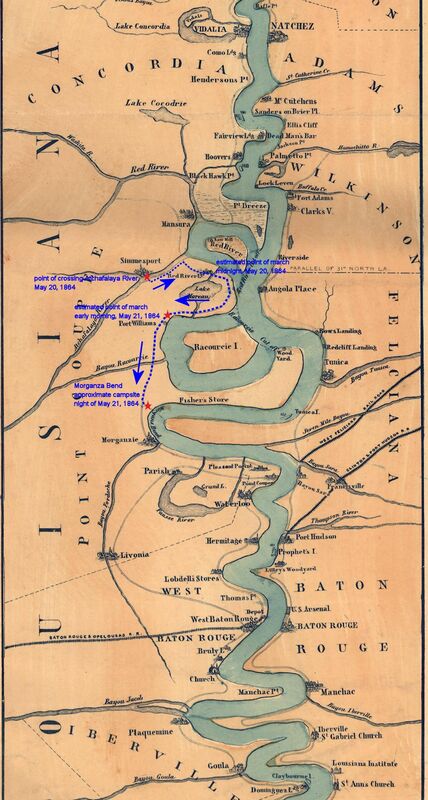 This period map shows the approximate route taken by the 16th Ohio and other troops under Gen. Nathaniel Banks as they moved east and south from their crossing of the Atchafalaya River at Simmesport, Louisiana, to Morganza Bend, Louisiana, along the Mississippi River arriving late on May 21, 1864. 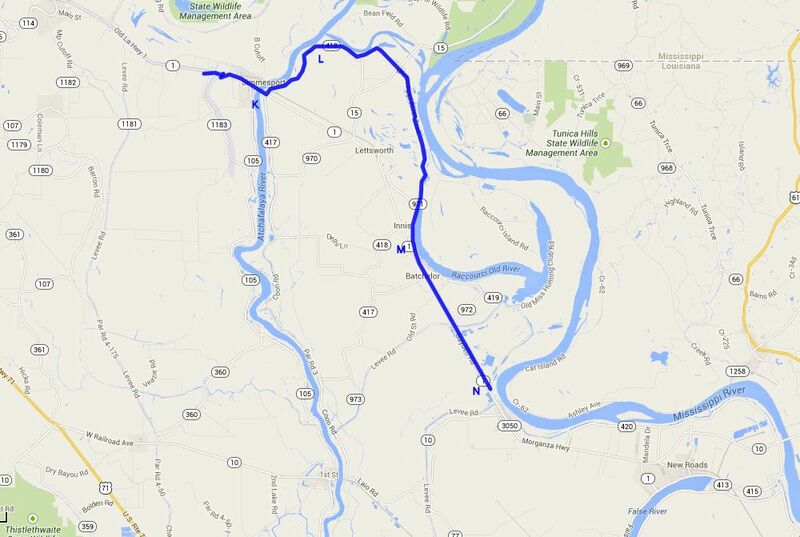 K - Location of the steamboat bridge where the 16th Ohio and all of Gen. Nathaniel Banks' troops crossed the Atchafalaya River on May 20, 1864, at Simmesport, Louisiana.